124 registered members (aquariuscsm, 55hambone, 1978elcamino, addyguy, ad244, 11 invisible), 2,155 guests, and 30 spiders. The shifter is quite strange. Last edited by StevieC; 12/04/17 08:06 PM. I rode in one of those when i was 5. Even in Eastern Europe, they where not seen a lot outside of East Germany. I watch all sorts on Youtube and this shifter was really weird so I thought I would post the video here... I have been in a 2-stroke Russian made car. (Can't recall the name of it). When I was in Europe. It was loud and stinky. I will have to go back through my photo's it was years ago. I drove one when I lived in Greece and his descriptions and evaluation is right on the money. If you care about mechanical things this car keeps you involved while driving. It was fun but its like snow, fun to play but it's good to go home. Have a "match-box" miniature in beautiful lime/green. Saw one in Budapest this past summer. Not many left. In the 70's rode in one a few time. It didn't seem like a bad car. I enjoyed the ride and all the good memories. Europe has such wonderful small cars. Most of out cars and especially large Suv's look quite ugly compared to what's offered in Europe. It was given disabled people for free. It was never called a car and did not require the driver's licence. Last edited by Ded Mazai; 12/04/17 09:18 PM. This guy doesn't know anything! They used Duroplast for the bodies which is a mix of formica and bakelite. The 2T engine was easy to work on and was pretty durable for what it was. They were a big step below the Wartburg (Formerly EMW a BMW division), the Skoda and Tatra especially the rear mounted air cooled V8. I always thought Trabants were made of some steel with a paper machie type body mix. The two stroke was related to the DKW engine also related to the SAAB. After every world war Germany has to release all their patents and usually any foreign subsidaries for free use. So SAAB got a free DKW 2 stroke design and I think Trabant did too . No Russian 2 strokes that I recall, the Moskvitch? was a pre war Opel, supposedly disassembled and taken from Berlin area and reassembled in Moscow.....everything including toilets, toilet paper, light bulbs, etc. Russian T34 was an ALL Russian design, NOTHING from abroad, IIRC. 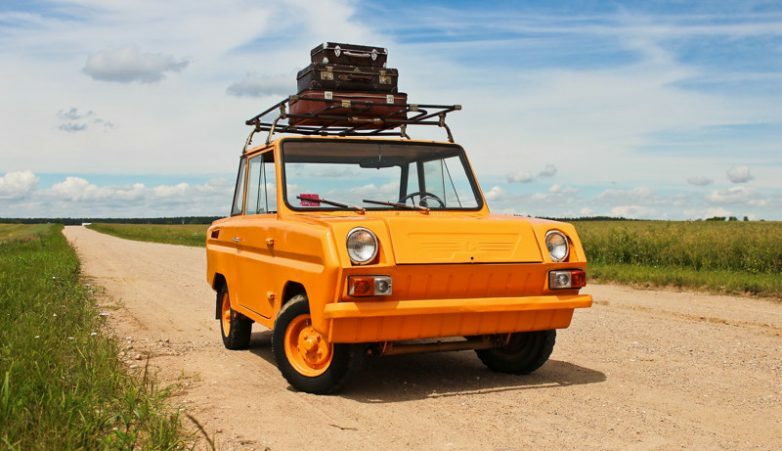 I remember, many years ago, when I was an exchange student in Germany, and took multiple side trips to East Germany (mostly Berlin), seeing these Trabants and thinking that it would be really cool to own one and do some customizing..
.. after watching this video, I definitely do not want to own one. I guess young North Americans won't have much experience with 4 (or 5) on the tree, but for other parts of the world it was pretty common. I used to have a 1954 Austin A40 pickup, at the same time my wife (girlfriend then) had a 1954 Series II Morris Oxford, both made by BMC, powered by the B Block engine. The Oxford had 1st and 2nd up to the steering wheel, 3rd and 4th then reverse down from there. The A40 was the reverse, 1st and 2nd down, higher gears and reverse up to the steering wheel. Like different shift patterns and sides on a motorcycle, we didn't have any problems swapping between cars. Apart from the DKW, the Japanese made some 2 stroke cars. Suzuki had several, one I remember had a triple in the rear, you went in behind the rear seat to adjust the carbs. My sister in law had a 2 cyl Daihatsu Max, we used to borrow it when we came to the city...I remember with no engine braking it would take off down the hills. In NZ we got all sorts of strange cars, but not the Tabrant. 2005 Nissan Expert - 5W-40 Castrol Magnatec diesel. 1996 Volvo T5 - Penrite HPR15 - 15W-60. Ryco syntec filter. I have plenty of experience with 3 on a tree, but nothing more. Four or more was always on the floor. Thanks for the young compliment!